Proline 7-Way Inline Trailer Camper Truck Plug Cord, Weatherproof and Corrosion Resistant 7 Feet In Length, Loose end. The Proline 7-Way Trailer Plug Cord is a commercial grade pure copper wire with copper spades in the connector head. 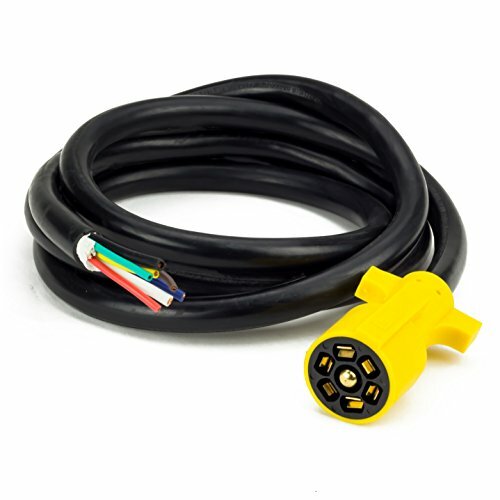 This cable is designed for trailers with additional power needs such as electric brakes, interior lights or reversing indicators. It's ideal for RV travel trailers, caravans, food trucks and other towed vehicles. The overall cable length is 7ft and it is weatherproof and not affected by weather temperature variations.